there have been great Comic Marts held in londonfor over 35 years and as of last week we have taken over the one held at Royal National Hotel London . if you are into comics , gold age ,silver age or the latest comics this is the place to find what you have been looking for . we very much look forward to seeing some of you at this great event for the real comic and collectable lovers out there . A Trader Convention :-) That's Awesome. That's great news. I remember going to these events in the 1980's and 90's. A thought occurs to me: I've attended these events for many years, primarily to buy trading cards. The new website has lots of information about comics, but trading cards are not mentioned. Would it be possible for the website to be updated to reflect the range of items on sale? I couldn't agree more. I've attended this show for years just for non-sport trading cards. There certainly are a number of tables at the London comic marts selling trading cards, either by the box or by the set, or with expensive chase cards - you will also find books old and new, maybe even pulp magazines from 1930-1960, T-shirts, comics supplies like bags, boxes and boards (usually rather cheaper than in the shops), film stills and magazines, action figures, heroclix, dvds, old radio shows on CD, maybe a pokemon card or two... just bring along plenty of cash, and wander around! can i ask a really stupid question and ask if you mean mags 2 like SFX etc? It's not a stupid question. I don't recall seeing SFX back issues, but then again I always preferred Dreamwatch. You never know, you might find someone who is selling them. I have bought back issues of Doctor Who Magazine there. It's worth going anyway just to get an idea of what these events are like. I went along today and there was a stall with a couple of back issues of SFX, as well as other magazines. I've never tried to sell anything at the events so I don't know. What type of magazines are you wanting to sell? i did have a very large collection, sold some of it but there are still a lot of mags. 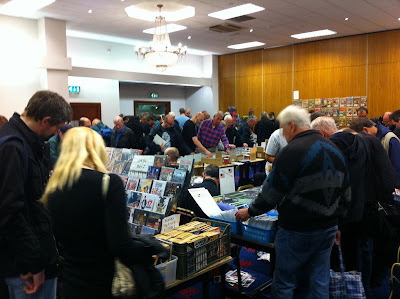 There are tables that sell current film magazines, mainly the imported ones, along with books and other tie-in materials - and there are plenty of tables selling the occasional dvd now. Come along to a mart one Sunday after an early lunch and check things out before committing yourself; I'm sure that, if they aren't busy, dealers will be happy to chat.